Partnership is important to the nonprofit sector. And rightfully so. Each organization doesn’t need the internal capacity to be everything to everyone – nor should they try. How, then, can nonprofits responsibly partner? What do nonprofits need to understand about themselves and their prospective partners before entering into (in)formal agreements? How could they approach this exploratory phase? How could three organizations in the same field, with different approaches and strengths, benefit from one another? Which organizations provide competing services? On paper, this triad makes a lot of sense, and the three groups might fit together nicely, but before jumping in, the groups smartly want to consider how the partnership will fit in with the larger nonprofit community and its related influences. While our conversations do highlight organizational needs and other aspects, much of our discussion is focused around the areas of determining the market, direct beneficiaries, and other organizations. Given that these three organizations work in the same field, the assumption follows that they work in the same market. But, once we dug a little deeper, we realized there are differences in how each organization has positioned itself within the community. For example, say these three organizations engaged in workforce development efforts. The approaches used to tackle challenges in this field can be quite different; so too can the markets in which organizations may operate. One organization might be focused on formal skill building, another on placement with private employers, and the third on job-seeker education. 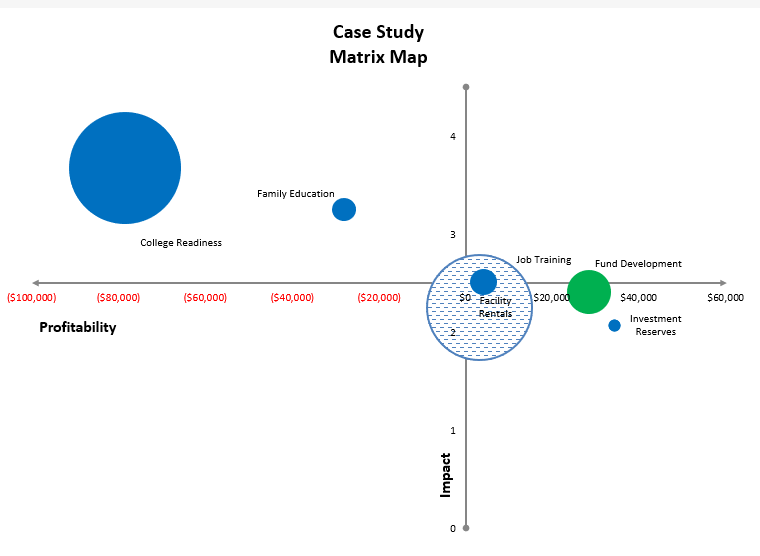 Each of these areas within workforce development constitutes a different market, encompassing a unique web of direct beneficiaries, funders, and competing organizations. However, this does not automatically eliminate the possibility of working together, but being clear upfront about these market definitions is critical when evaluating opportunities for partnership. After defining the organizations’ markets, we created an exercise to identify the unique strengths of each nonprofit within the context of that market. In our view, partnerships should be built on what each organization brings to the table, not what is lacking in their portfolios. How do we describe a Focus A and B beneficiary? What common needs do these groups have? Are there common interests (beyond the mission of the nonprofit organization) that the group shares? Are there gaps in services to meet the needs of the groups? Building this initial profile of the organizations’ constituents allowed us to understand the universe of people receiving support and benefits. It also surfaced who is not being served by the organizations and what is missing in order to adequately engage the populations identified. At the end of the day, the three organizations might want to have different direct beneficiaries, but we first needed to have a deep understanding of the primary pool of individuals before partnership strategies could be formulated. We also wanted to understand competitors as a final consideration within our exploration process. Identifying competitors can occur alongside the investigation of market definition and direct beneficiaries. Included in this analysis was an examination of those potential competitors’ direct beneficiaries and other organizational characteristics. While additional questions and work will need to be done to finalize a partnership, the exploration phase should include an external market view. Potential partners can identify overlaps, strengths, and compliments in services across the organizations to ensure a viable relationship. Then, nonprofits can decide what areas they would like to continue exploring, and in which areas there is no market for a partnership.